UK Groundwater Forum | Why is Groundwater Important? Groundwater makes up nearly 30% of all the world’s freshwater; only 0.2% is found in lakes, streams or rivers and 70% is bound up in snow and ice on mountains and in the polar regions. As rivers and lakes tend to be supported by groundwater, it is not exaggerating to say that almost all the water we use for agriculture, industry and drinking water is either groundwater or has been groundwater at some point in the water cycle. Groundwater plays a number of very important roles in our environment and in our economies. In the environment it supports rivers, lakes and wetlands, especially through drier months when there is little direct input from rainfall. The flow of groundwater into rivers as seepage through the river bed, known as baseflow, can be essential to the health of wildlife and plants that live in the water. 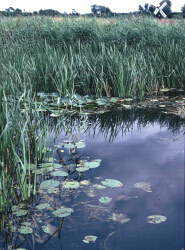 It is often present in those areas where there are limited surface water sources. The quality of groundwater is usually very good, and it does normally require much less treatment than river water to make it safe to drink. The soil and rocks through which the groundwater flows helps to remove pollutants. The quality doesn’t change much through the year, which can be important for industry. Groundwater also responds slowly to changes in rainfall, and so it stays available during the summer and during droughts when rivers and streams have dried up. Groundwater is relied on in many parts of Africa and the developing world, because it can often be found close to villages and it does not require the large costs which may be associated with capturing, treating and piping surface water. Groundwater doesn’t require expensive reservoirs to store water in before it is used.